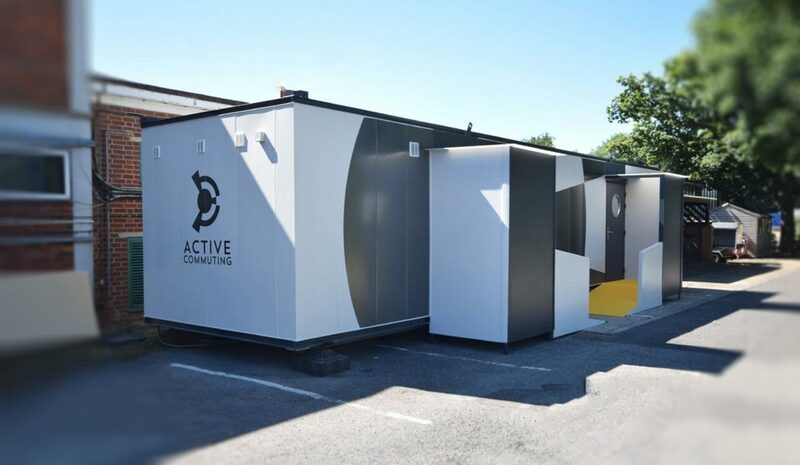 This 120MF pod delivered to a GE Healthcare Limited site in Buckinghamshire; utilises 5 car parking spaces and caters to over 50 Active Commuters. The following is a description of the procurement process from start to finish. Our client downloaded the catalogue of our products from the website. They then filled out the contact form and asked us to get in touch. The site Director and his team had a clear idea of how many people they needed to cater for, where the pod was to be situated and how the facility was going to be managed. This made choosing the pod they required from the catalogue straightforward. At this time, they were planning to build a new indoor gym to complement their existing; outdoor gym, bike store, putting green and large lawn used as a 5 aside football pitch. The Active Commuting pod was to be the hub. The next step was a site visit to determine access for delivery, and to discuss the full ME specification of the pod. This took place with the client and their plumbing and electrical contractors. •	Architectural design of site, including renders. •	Manufacture and provision of accessories; ramps, stairs, porches, gantry’s. •	Delivery, installation, and connection to water, waste and electrics. Then the final quotation was issued, including the accessories and other services selected. In this document was the production plan for the pod manufacture. The hire contract was then drawn up and signed by both parties. The client then issued the Purchase order. When we receive the Purchase Order, production starts. ALL the materials to fulfill the contract are ordered, production line space allotted, and trades employed for the building and fitout. As the pods are built to our design. The windows, doors, partitions, benching, painting, vinyl wraps and other interior features are all bespoke. The whole process takes just 10-12 weeks. This is the quickest part and can take just a few hours if the site is ready to go. The pods are moved into place by HiAB crane truck, or lifted off articulated lorries using mobile cranes. It all depends on the site, access, and what pods are being moved.